I'm still in a state of confusion as to how soon Haachin's graduation is, despite being fairly aware that it's literally around the corner. I suppose it's because it was a little more rushed than most, and there hasn't been a hype around it like Duu's or even Zukki's. So, I'm still in a state of delusion, thinking that it isn't the end - not just yet. Even planning these posts isn't helping the realisation to settle in any quicker. That said, despite being ignorant to my own feelings over Haachin's graduation, I must admit that after viewing her first - and only - Greeting's DVD, I was overcome with a sense of sadness. It hit me pretty hard that very soon, the only two non-birthday solo DVD's she would have been given are themed around her introduction, and then her goodbye. It's shocking to acknowledge, and makes watching her Greeting even sadder than I had expected, because after seeing this for the very first time, I actually wonder how she never received another solo DVD of any form. Haachin is very endearing and entertaining to watch, and you can really see how fun and cute she is here. So, after the disappointing lack of Haachin in her debut PV's, it's time to sit down and take a look at Haachin in her solo journey through the 'Greeting' DVD. Much like a photo book, we will embark on a visual trip with the cute and upbeat Ogata Haruna, an angel whose image has not been appreciated enough in pictures or cinematography. 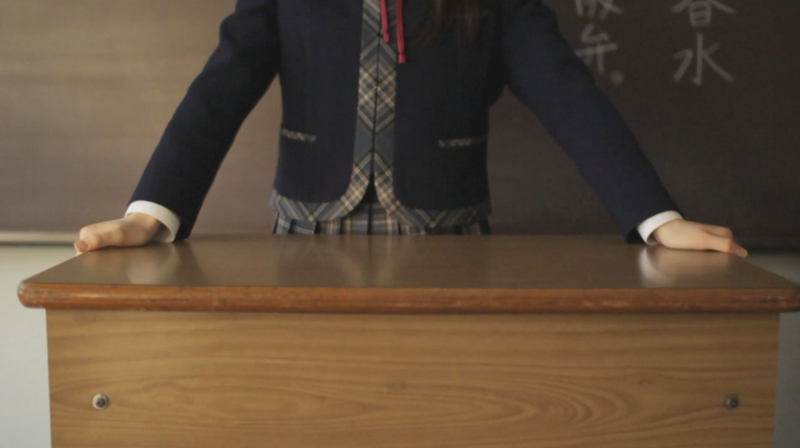 Welcome to Greeting ~Ogata Haruna~. Are you ready for your heart to still? I already feel calm upon seeing Haachin's face. Out of all the members so far, she has one of the most soothing presences. Her facial features are really soothing, too. I feel so serene when I see her face. Seriously though, how can you not feel calm upon seeing this girl? Sure, she looks like she's judging you hard, but her demeanour, the way she composes herself, it feels rather relaxed in a way. Not always, but these scenes especially just calm me down. Haachin seems so comfortable and natural (aside from all the staring into the camera, of course). I'm feeling a little jealous of those who will see Haachin in a University setting one day. Damnit, you get to see Haachin wonder the library just like this, but in everyday clothes! Lucky! As someone who would happily spend hours in a library or bookstore staring at the shelves, I feel incandescently happy watching this scene pan out. It's such a beautiful, calm sequence. 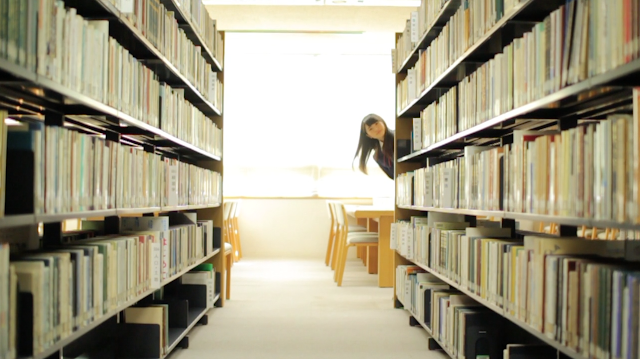 Of course, I could totally watch Haachin staring at books for hours as well, buts eeing her doing exactly as I do in a library or book shop... yeah, I feel calm again, and stupidly happy. I love all the little details, just like this. It makes a difference to the feel of the video, delivering a subtle yet personal touch. HOW is she this pretty? Best part is, Haachin has barely changed. She's still as gorgeous as the day we were introduced to her. Yeah. I had to GIF this scene. I just love how beautiful this entire scene is, and how natural and cute Haachin is here. Plus, that naturally awkward smile is adorable. These are precious moments, people. Treasure them. Make them your backdrop. Put them on your phone's file. Do whatever you can to preserve the beauty, sweetness and purity of Haachin. I feel like this is the very image fans have of Haachin when they think of her. A girl who is as brilliant as the sunlight, bathed in warmth and beauty. Ooooh, our sweet and pure Haachin is getting dominant! Quick, to your seats, people! This is adorable, and the least dominant stance ever. Haachin is far too cute! Ah, okay! I'll give you a hug! I love those shorts, just sayin'. These are some of my favourite shots of Haachin in this entire video. Actually, there are more shots I love of her as well, but seeing these made me realise just how calming she is to look at, and how pretty she is. Her eyes are so bright and clear, you can clearly see her emotions in them, and her face is just so soft and clean. How can I not be mesmerised by her? Actually, here is where some of her awkwardness shines, but whatever, it's endearing. I also noticed how awkward her smile can look in these shots. Still, it's cute. She's cute. Once again, little details like this. Haachin has rather long hands, come to think of it, but they are one of a few features that are showcased quite a bit here. This is a banner worthy image, and a backdrop worthy one, too. Damn, she's gorgeous. Dreamy Haachin is just so lovely to look at. She is breath-taking. That little toothy smile really captivates me, too. It's not at all awkward, and it looks natural. She just radiates warmth at this point. I feel like Haachin in a pale pink coat is one of the best things ever. She really suits pastels and pretty clothing. Such a girly, cute thing! At this point, I was convinced this was a full-on photobook. Lord, I wish I had managed to grab a copy of the mini-PB that accompanied this DVD. Alas, it didn't happen. Seriously though, I just love the focus they seem to have on her hands. Just tiny details like this make me adore this DVD all the more. Far too adorable. Far too good for us. Okay. I love these scenes. They're so simple and natural, and they feel comfortable and - yet again - pure. I just feel so damn relaxed watching Haachin in this serene and undisturbed state. She's adorable, that smile is mesmerising, and the way her eyes warm up as she looks towards the camera is everything. She is such a doll. How has she never had a full photo book release? HOW? A bit of knee action was needed. So, yeah. Have a knee. This is all kinds of adorable and playful. I love how Haachin is just so relaxed and cute, and acting so nicely for the camera. She really is a breath of fresh air. "I love you THIIIIIIIIIIIIIIIIIIIIIIIIIIIIIIIIIIIIIIIIS MUCH!" This is a nice setting. You can really see the cogs in Haachin's head turning, and the feelings that are coming up. You can really see how much this setting means to her. It's a really heartwarming moment in the DVD. Again. These little details. The fact that she's using old, worn and battered skates shows just how much Haachin skates, and how much she loves it. If management had requested she wear brand new skates, then it would certainly be a 'visual only' type deal. Here, though, we see that personal touch come in again. These skates are loved, and they're Haachin's, that much is clear. I love everything about this snippet of a scene. Haachin, tranquil once again, and looking so damn beautiful like always. I'm so glad they put something like this in the DVD. 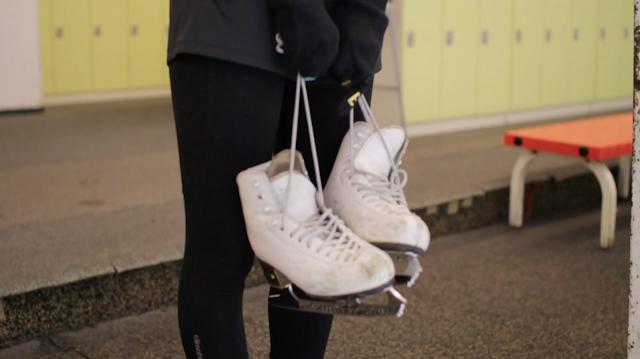 No other member will have something like this again, because Haachin is at heart an ice skater. No other member could compete with her in that regard. She seems so at home,. This is definitely her happy place. I just love how comfortable she is here, awkward grin and all. You can see how happy our sweet Haachin is! And what a lovely skater she is, too! I don't know much about ice skating, but it's something I like watching in general. It seems so graceful and peaceful for a sport, and though Haachin may not be the best dancer in Morning Musume, you can see the grace, posture and rhythm that ice skating has taught her. Okay, THIS is the Haachin I am living for. She is so freakin' CUTE! How could you not love her in this very moment? It's hard to grab images when they move as much as these scenes, but honestly, Haachin is beautiful when ice skating. I don't think she is the best ice skater out there, but she is beautiful regardless, and you can see she knows her stuff. It's fun watching her and seeing what she can do on the ice. 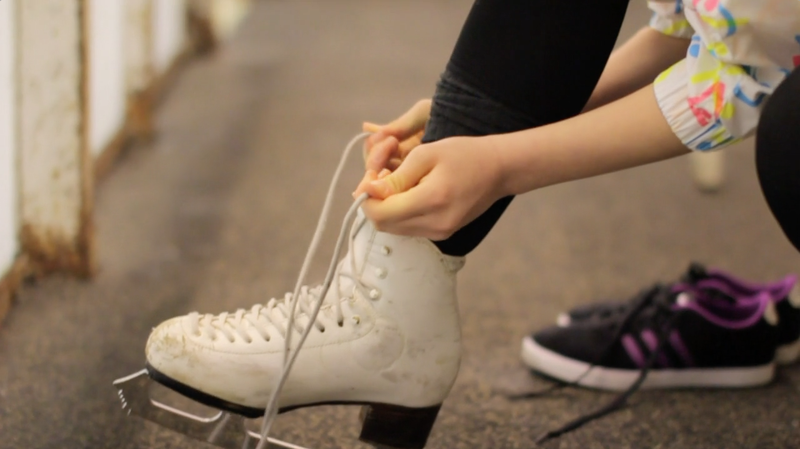 I really wish we had a DVD or something where she taught her fellow members how to ice skate. If there's one out there somewhere, please guys - HIT ME UP. Side note, I honestly wasn't aware that Miyabi had made an appearance in one of the Greeting DVD's! This has to be one of my favourite settings from this DVD. I love the sunset, how it lights the hay and how warm and beautiful Haachin looks. It's a fitting scene for her, delivering the a beautiful backdrop for a beautiful idol. She is so cute, and I love how she looks so calm but happy. Her eyes just seem to light up. The awkward smile comes back, but it's cute, of course it is. I love looking at Haachin and her various expressions. She's such a charming young girl. Okay. A Trio of perfection. We have been blessed by Heaven itself, people. This scene makes me think 'awkward DVD stance'. And yes, it is a little awkward, but Haachin's smiling and it shows a nice landscape, so I wanted it in. Plus... WATER! I love this thoughtful, cute and awkward Haachin. Her early days were so precious, but I can see why people fell in love with her, especially those who watched this DVD. She truly is captivating, and that awkwardness will only endear you more. The thoughtful, dreamlike version is wonderful as well. Okay, rewind: EVERYTHING about Ogata Haruna is wonderful. Too adorable for words. Can I hug you? I feel jealous of the cameraman who was walking alongside her, mimicking a date walking with his girlfriend. I feel like Haachin will topple over if she isn't careful XD She's at a dangerous slant right now! Well, you are everyone's idol, so I can't be mad even if you were staring at someone else. Le sigh. A warm and sweet smile before you say goodbye. How bittersweet. And now it's time to bow out and take your leave. Even though the time spent with you was short, it was sweet and will be burned into our memories for years to come. Thank you for giving us your time, your smile and your everything. Thank you for walking with us and being a part of this journey, Ogata. It was a lot of fun. The end of my mini-commentary feels much like the end of Haachin's time with Morning Musume, and whilst we still have a fair few days ahead of us with Ogata Haruna the idol, I felt that these words were fitting. It also makes the realisation that her graduation is really going to happen set in, and after viewing this DVD and looking back at the images, I feel sad once again. I will really miss Haachin, especially now that I know just how little she has been featured or given in terms of singing and visuals. 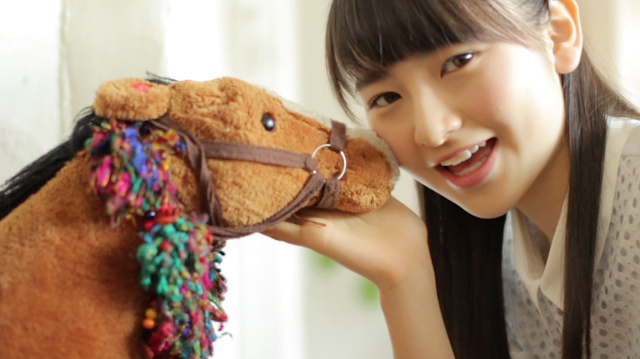 After watching Greeting ~Ogata Haruna~, I feel confused as to why she wasn't given any more. I know her popularity may be a reason for it, but there have been countless members with high popularity that aren't even given photo books or DVD's - just look at Tamura Meimi and Sato Masaki. And it can't be a question of Haachin not wanting to do a photo book of some form, because she stated herself she wanted to challenge herself in that form of media, so it baffles me as to how she has been a member for these past few years and been given nothing in terms of visual media, aside from this DVD. This is a lovely DVD, by the way. Much like other variants of the Greeting's releases, Haachin's follows suit in a date-like, pretty setting that allows us to hear some answers from Haachin to get to know her better, accompanied by visuals that are flattering and beautiful to look at. I really loved every moment - even the awkward parts - and found Haachin even more endearing than before. I can see why people are charmed by her. Ogata Haruna is a beauty, and she's really cute, too. She has a serious, cool look about her that melts into a cute, serene appeal at times. Her energetic smile and the way her eyes light up is incredible, and the warmth she exudes just makes me want to love her even more. I have to say, after viewing this, my love for Haachin seems to have heightened, despite her already being a member I like a great deal within both Morning Musume and Hello! Project. Somehow, I just adore her more. Maybe it's that calming aura she has, or perhaps it's that inherent cuteness I keep going on about? Who knows. She is charming, and she is sweet. Haachin is an idol who, though less impactful in a live or studio setting, has her own way of capturing you on-screen. The way she looks at the camera, the warmth in her eyes and the purity of her presence in this video showcases her loveliness and the quality of her charm as an idol. But, watching this now with very little time to appreciate her as a member of Morning Musume, you are left with a bittersweet feeling. It's sad to know that a girl with this much warmth, hope and brilliance will no longer be in the entertainment industry - at least, not for a while - when right here, she was full of determination for her future as an idol. Greeting ~Ogata Haruna~ is gorgeous in so many ways, and even the small, awkward moments are precious, but it was more of a sad journey when I finally sat down to watch this. I found myself falling in love with Haachin more, but the further I watched, the more the realisation set in that it was too late for my to fall in love with Haachin more than I already had. I love Ogata Haruna, and I love this DVD, but right now I realise just how much I will miss her as I have done countless others. She may not have had a big role within the group, but she made her stamp, and seeing this video made me understand that no matter what, I will miss Ogata Haruna and she will never be replaced. Thank you all for reading. I hope that these images and snippets of Haachin help you to understand her beauty and grace, and just how precious she is amidst the countless idols you love and follow. Please don't forget these wonderful moments of Haachin in all her visual, gorgeous glory.